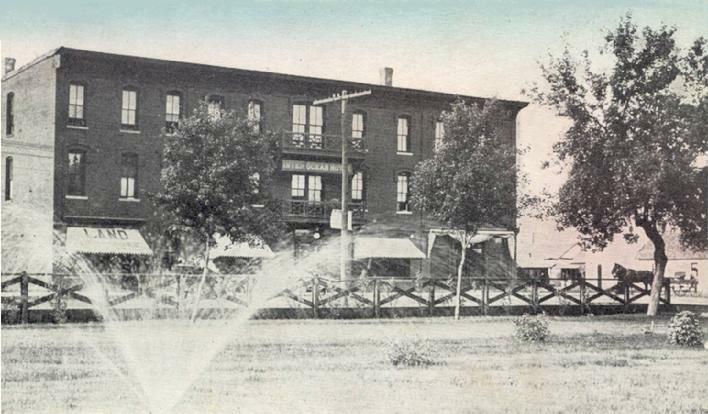 Fredrick and Robert Hager from St. Paul MN opened the InterOcean Hotel across Main Street from the new Northern Pacific (NP) Railroad Depot. The Hager Brothers had prospered as a result of the real estate speculation and the lumber business. Watching the after-effects of the flood of March 1881 through bionoaculars on a bluff on the eastern side of the Missouri River, Frederick was on a train back to St. Paul, and convinced the NP Railway Land Office, The railroad sold one-half the lots in the western part of the city to the Hagers. Frederick returned with railcars of lumber, and brothers Robert and Joseph would join the elder Hager in the lumber business at their site in western Mandan. Purchasing property in western Mandan for just over $60 a lot, they would resell them within two years for between $500 and $1500 each after the NP Railway established the location of their new passenger depot near there. The new hotel, located at the northwest corner of Dilworth Avenue (today's 3rd Avenue NW) and Main Street was built and furnished at the cost of $86,000 (equivalent to $1.9 million in 2009) and was the first three story building in the city and opened in April 1882. Art Kredler was its first manager, a position he would retain until forced to resign in February 1926 due to failing health. 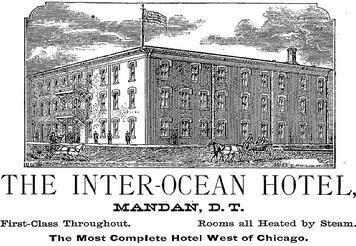 The InterOcean Hotel was among a number of hotels that were established in that area of town. The hotel was a magnificent three-story brick structure, located immediately opposite the new $12,000 Northern Pacific Railway passenger depot. The opening closely coincided with the completion of the NP railroad bridge across the Missouri River. The Hager Brothers would invite other notable capitalists of the day to also invest in the booming city of Mandan. Marion A. Vinton of New York, Tilden R. Selmes of St. Paul and several others were all eventual investors and spearhead building several brick stores in the western portion of the town. "The hotel is fitted up throughout in most exquisite taste and is absolutely perfect and complete in all its details. The management which has devolved upon Mr. John Hager has been fully in keeping with the house vis. superlatively first class and the happy combination has made the "The InterOcean" the most powerful advertising medium of Mandan." Among the many exclusive features of this hotel, one of the most noteworthy is thorough system of sewage introduced here, and generally so lamentably neglected in Dakota hotels. The house is heated by steam throughout by one of Osborne's patent steam heating apparatus, placed in this building at a cost of $12,000. Each room is furnished with radiator which can be regulated to suit each individual guest. The furniture throughout the hotel is exquisitely elegant and reminds guests of the finest hotels in New York. The dining room help is composed of colored waiters. Great pride is felt by the citizens of Mandan at this superb carevansary and its great elegance is best understood when it is stated that such distinguished parties as Henry Villard, Rufus Hatch, Sir John Rose and others who enjoyed the hospitalities of this hotel during the past summer unhestatingly and frankly pronounce it the best and mote complete hotel west of Chicago Sitting Bull would attend a musical play there. The property would be purchased in 1916 by R. B. Hanna and renamed the Lewis and Clark Hotel. 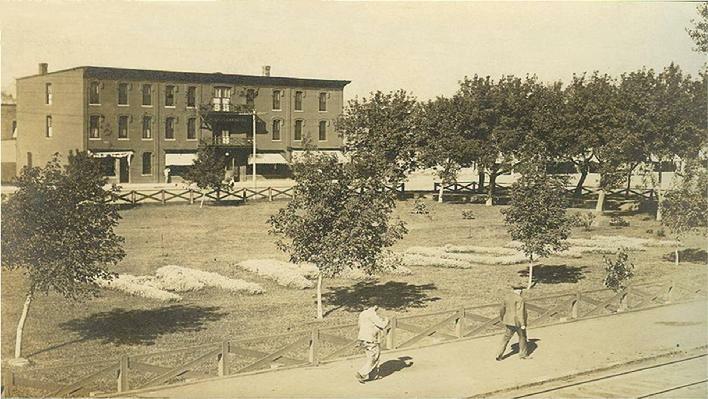 The building was torn down the following year and a new hotel built on the site which openned in January 1918, which remains in place today.